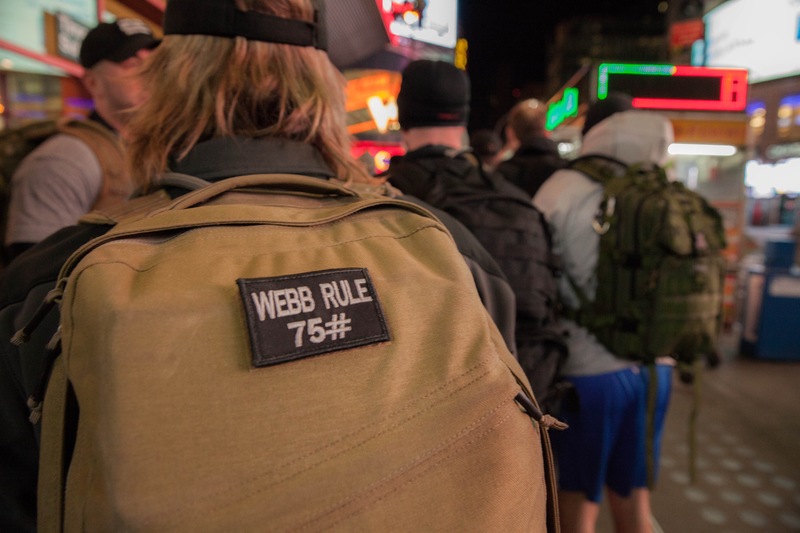 This time two days ago I was preparing to head to New York City for a very special event – my 25th Goruck Challenge. With 2 dozen under my belt you’d think there would be little to learn or surprise me but class 488 proved me wrong. 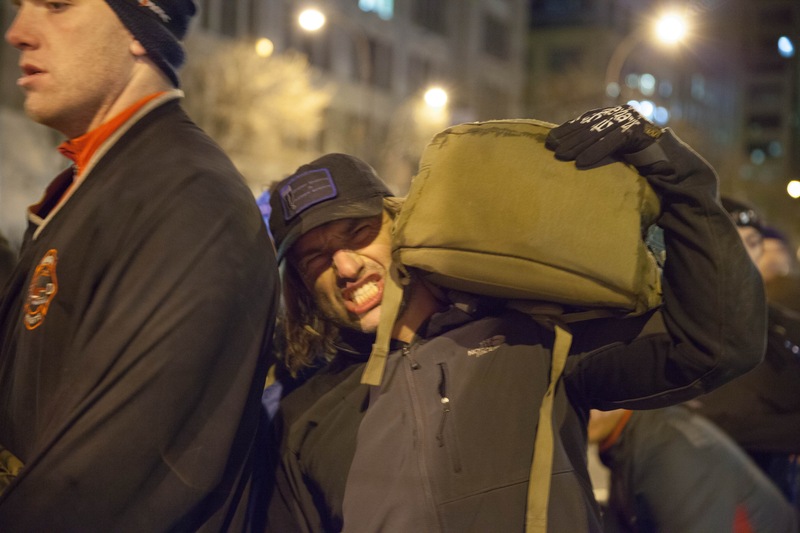 As setup to the story, let’s step back in time a few months to a thread in the Goruck Tough group that was punctuated with Goruck founder Jason McCarthy modifying my personal requirement of bricks at a challenge to a 75lb ruck (usually a 6-brick ruck would run at 35-50lbs) and he named it the “Webb Rule”. Since then I had ran two challenges under that rule as well as a couple without (due to a recurrent minor back injury – unrelated to the heavy rucking I might add). And it sucked. But as with the regular challenge they get a little easier each time. Fast forward to this weekend. 75lb pack on (closer to 80 with water) and the challenge began with the infamous Beaux. Familiarity made that first run easier than last time. PT and welcome party was also a little better than last time. The back was feeling strong. Life was good, and the new friends in the class were getting to know each other. Then it came. For the first time since using the extra weight, I had to go strapless with the ruck and carry by the handle in a farmers walk. I went as far as I could but the grip strength needed was just not there. The team eventually let me be flag bearer so I could “ruck up” and carry on my back again. Time went by and once again we had to carry our rucks without straps: specifically cradled like a baby. This was horrendous. To counterbalance the weight I leaned back considerably and the strain in my posterior chain as well as my arms from the weight was unbearable. From time to time I had to move the weight to my shoulder (let’s pretend it was to temporarily burp the baby). Advice came in on how to carry it but the back strain was just horrible regardless of what I did. We made this movement, and things felt better and I never had to jump to the flag. Then time passed and things changed again. This time the requirement was to carry the ruck with shoulder straps over the forearm like a purse. This was horrendous!! I couldn’t do that and keep up with the team. For the first time in a long time I was the slow person by a long way. I even had thoughts of leaving the group (which rarely happens). I was entering a dark place. Suddenly and without any further thought, my team of 26 did exactly what the challenge teaches you to do. They put aside their own comfort and took my ruck giving me another to carry. I was saved and humbled. I never asked for help in so many words but help was there anyway. There was never a complaint about the weight of my ruck, they just absorbed the pain and made things work. This is what the Goruck Challenge is about. You look to the person the the left of you and the right of you and put their needs above yours. 488A did this and did it with style. I will always remember this challenge as one of those where I truly faced some demons only to have them stomped out by my 25 brothers and sisters. I am humbled by the selflessness and the speed with which teamwork was learned and just that little bit prouder to be part of the family that is GRT.